Is your baby seeming a bit too old for your assortment of rattles? Has your little one outgrown her activity gym? When your kiddo enters a new stage of development, it's normal to feel stumped about what toys she's ready for or what activities would be fun for her. And the 6-9 month range is a common one for some head-scratching on these topics. Let's face it, at this age your baby really shifts from being a dependent infant to being an active explorer. If she's not already rolling, sitting and trying to crawl, those milestones are coming SOON! One helpful way to gain clarity is to understand the "developmental work" of your baby's age. 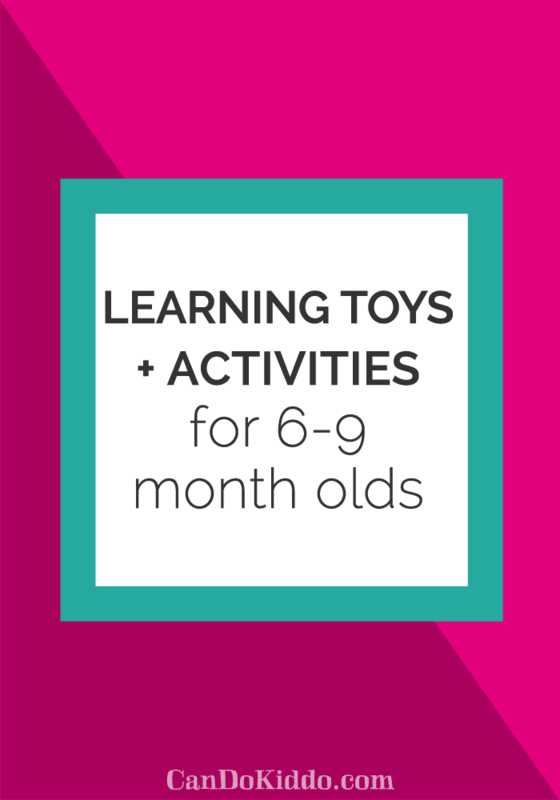 So let's look at what 6-9 month olds are learning and what toys can capitalize on those emerging skills. Prefer to watch a video instead of reading? Want to see exactly what these toys and activities look like? Check out my Facebook Live Broadcast on this topic! Object Permanence is the skill that makes Peek-a-boo so much fun! It's the magic of knowing that something is still there when it's hidden from view and the joy of looking for and discovering it! A few of our favorites are: Where's Spot? For this age group, look for visually simple books with uncluttered pages. Skip books where under the flap is a written word labeling the picture. Reinforce flaps with clear packing tape to make them more durable and minimize ripping. For books with sticky flaps, line the inside of the flaps with Elmer's glue (dries clear) and leave open to dry. This lifts the flap slightly and makes it easier for baby to lift on her own. Your baby is probably too little to be interested in stacking but you can use stacking cups to hide smaller toys under for some object permanence fun! Hide different toys under a bunch of cups or hide toys under only a few and let your baby hunt for them. Try hiding rattles or noisy toys under the cups and sliding them on the floor for baby to get curious - "Oooooo, what's under there making that sound?" I love these for all SORTS of safe sensory activities for mouthy babies and their shape makes them perfect for manipulating with two hands while sitting. You can fill them with bells, Mardi Gras beads, water beads, holiday decorations, small plastic animals, colored cereal - the sky is really the limit since they're safe from mouthing! And they come with some lids that are perforated so baby can smell the contents for added sensory fun. Occupational Therapist Tip: You can modify these sensory tubes to tap into your kiddo's love of object permanence play by rolling a piece of paper inside one end of the tube to obscure what's inside. As baby tilts the tube toward one end, whatever loose objects you've put in the tube is revealed! These are GREAT for hanging toys so that baby can work on reaching and playing with items above floor height. Hang toys from crib rails, refrigerator handles and more! The higher baby has to reach, the harder it is to balance. So start with objects hanging at chest level and increase the height as baby gets more steady. And makes sure she has a safe, soft landing spot (I love the Tipsy Baby Sitting Mat for this purpose!). Eventually, baby will be ready to pull to a stand and you can hang toys just above seated reach to promote this new skill (make sure furniture is stable!). You can also use plastic links to make a chain to attach to toys. Place the toys on the floor out of baby's reach in sitting but give baby the end of the chain and watch her figure out that she can retrieve her toys by pulling. Perfect toys to practice playing with the hands while sitting up (a tricky balancing skill for new sitters) and to promote baby to try crawling to see the other sides of the cube. Occupational Therapist Tip: Look for a cube with a removable top (like the one I've linked to) so that you can weight the bottom of the cube with a 5 lb. bag of flour or sugar. Inevitably your little one will try to pull to a stand by pulling on the top of the cube and you want it as sturdy as possible to support that new skill. Books start to get a whole lot more interesting once babies can hold and manipulate them independently. Giving your baby access to (durable) books is a great way to promote an early love of reading. Occupational Therapist Tip: You can also modify any board book by wrapping hair rubber bands around the spine for easy independent page turning. Learn more and see photos HERE.